Reunion, wedding & event digital photography service. Harrisburg, PA.
3 Koups Cycle Shop Harrisburg, PA.
Harrisburg, PA. Kawasaki, Ducati, Suzuki, and Moto Guzzi dealer. Harrisburg. Full-service, not-for-profit institution that provides electronically delivered financial services. Providing organizational and leadership development services to the Harrisburg region, in Pennsylvania, USA. Religious, residential, commercial and institutional architectural services. Based in Harrisburg. fixed base operator offering aircraft maintenance and sales, charter services, and a flight school. contains the central pennsylvanias visitor and travel guide, daily arrivals and departures, and current weather forecasts . contains the central pennsylvanias visitor and travel guide, daily arrivals and departures, and current weather forecasts. CPA firm with offices in Harrisburg, Mechanicsburg, and Hershey. Includes service-bureau-supplied newsletter, financial tools, and links. A full-service portrait, wedding and commercial photography studio serving the greater Harrisburg and Central Pennsylvania area for 26 years. The best value in photography. Serving the Harrisburg Area with award-winning photography for over 19 years. Located in Harrisburg. Features new and used RVs, SUTs, accessories and a full service center. Interpreting, translation, technical writing and multilingual communication. Company based in Harrisburg, York, Malvern, Pittsburgh and Philadelphia, United States. Specializing in small business accounting, Quickbooks consulting and training, and individual and business tax services in the Harrisburg, Pennsylvania region. Offers shorthand, typing, and other secretarial services. Serves the areas of Carlisle, North Shore, and Harrisburg, Pennsylvania. services include, fuel, sales, flight school, maintenance, parts, avionics, charters and rentals. located at the capital city airport (cxy) in new cumberland, pennsylvania. Harrisburg-based design firm offering samples of design and illustration including vector graphic, logos, brochures, posters, and packaging. Stud service, guidance and support offered for new owners. Custom artwork of alpacas and other animals are available in both oils an watercolor. Located in Harrisburg, OR. Harrisburg, Pennsylvania photography featuring city scenes, architecture, events, and people and places. Delivers fresh arrangements, plants and gift baskets from two Harrisburg locations. Includes wire relay service and product care tips. Flower shop delivers fresh floral arrangements, plants and gift baskets from two Harrisburg locations. Includes wire relay service and product care tips. A family owned business located on the grounds of Polyclinic Hospital in Harrisburg. Offers free delivery and personal service. Official website of the Harrisburg, Pennsylvania Senators minor league baseball team. Site contains news items, roster, pictures, scores, statistics and ticket information. All-female, amateur, flat-track roller derby league in Harrisburg, PA.
Providing classes in obedience and agility at all levels. Class schedules and descriptions, trial results, a state-wide trial and events calendar and an article on crate training. Harrisburg, Pennsylvania. Information on courses in and around Harrisburg. Kennel history and photographs. Harrisburg, North Carolina. Specializing in blues. Photographs. Harrisburg. Information on the Washington vs. Harrisburg case. Harrisburg, Pennsylvania. Member and dog information, pictures and learning techniques. Offers details on instruction, travel, and an online newsletter. News and clubinformation. Located in Harrisburg. Pedigrees, photographs, breeding plans, and information on their obedience school. Harrisburg. Statistics, roster, kids page, direction to games and cheerleaders for the team. Official website for the club. News, mailing list, team contacts. Members, newsletter, events, past shows results, and rescue information. Rhonda offers spiritual intutive readings, reiki classes. Harrisburg, Pennsylvania. Eighteen hole course located in Millersburg. Includes prices, directions, course map, and events list. Presenting show records, photographs and breed information, as well as litter details and breeder history. Harrisburg, South Dakota. Harrisburg based indoor and outdoor team. Includes member profiles, a photo gallery and practice information. Meet StarPons Polish Lowland Sheepdogs in Harrisburg, NC. Donna Gray has been a breeder of PON since 1988. Dr. Edwin A. Aquino practices acupuncture in Harrisburg, Pennsylvania. Includes details and history on state-maintained roadways, special pages on Harrisburg, Philadelphia, Pittsburgh, and Erie, exit guides, and photographs. Club practice times, courses, results and related links for this Harrisburg club. A Harrisburg, PA, area bicycle commuters bLog. Day-to-Day antics and views ranging from tool reviews to daily experiences. Located in Harrisburg. Includes basic infertility information, details of treatments, services and facilities. Harrisburg. Offers 16 lanes, a pro shop, snack bar, arcade as well as specialty party services in Southern Illinois. Located in Harrisburg. Provides news, schedule, opponent information, roster, statistics, standings, and history. Special features include photo galleries and video highlights. Club for owners in the Harrisburg, PA area. Club information, members list, image gallery, and event calendar. Harrisburg microbrewers of TrÃƒÆ’Ã‚Â¶egs Bavarian Lager, Winter Oatmeal Stout, ESB, Nut Brown, and Pale Ale. Includes news, distribution, tour and beer information. Established breeders offering details of yearlings entered in the Harrisburg, PA, Black Book Sale, details of broodmares and foals, and links.Embro, Ontario, Canada. Ecumenical Community offers independent and assisted living, as well as dementia/alzheimers disease care. Gastroenterology group in the Greater Harrisburg / Central Pennsylvania area specializing in the diagnosis and treatment of digestive and liver diseases. Member of the Mission Health Network providing patients in Saline County, Southern Illinois with health services and medical treatment. Breeder and trainer of Quarter horses for competition in Pleasure, Lungeline, Halter, and other events. Stodck details, achievements, photographs, and sales. Located in Harrisburg. Mens league based in Harrisburg, Pennsylvania. Includes news, scores, playoff brackets, results, schedule, message board, standings, photos, rules, shop, and prior year results. Representing the Twin Ponds Figure Skating Club based in Harrisburg, Pennsylvania. A nonprofit foundation that operates an outpatient therapy clinic providing physical therapy, speech therapy and occupational therapy services. Includes a list of services. Located in Harrisburg, Pennsylvania. Offers new and used computers, notebooks, and parts. Located in Harrisburg, Pennsylvania. Providing web and graphic design, maintenance, e-commerce, domain name registration and hosting services primarily to small and medium sized businesses. Based in Harrisburg, North Carolina, United States. A multi-venue (Vampire, Werewolf, Hunter) LARP in the Harrisburg, Pennsylvania area. Harrisburg. 5.6 acre design of a white-tailed deer. Photos and directions. Strategy board games club that meets twice a month near Harrisburg, Pennsylvania. Features an article about how to teach game rules, and an explanation of what Eurogames are. Listing of members, club location, meeting times, and tournament schedule. Photos of graffiti in and around Harrisburg, PA. Includes samples from the Melbourne, Australia metro region. general practice firm based in harrisburg. harrisburg personal injury and medical malpractice firm. Offers worship, youth, mission and articles. 121 Chosen Friends Masonic Lodge No.43 -- Harrisburg Pennsylvania, USA. Pennsylvania, USA. Meets second Thursdays, 7:30 pm. Calendar, officers, history. harrisburg attorney offering services for personal injury, disability claims, and workers compensation. Harrisburg, Pennsylvania (nondenominational). Beliefs, upcoming events, ministries, and meeting information. located in harrisburg. provides information about their staff, services, products, facilities and current obituaries. located in harrisburg. includes firm overview, areas of practice, attorney profiles, list of representative clients, and directions to offices. providing broad services to business and individual clients, for matters including civil and criminal litigation, from offices in harrisburg. general practice with offices in elizabethville and harrisburg. Family tree as compiled by Charles G Crow (Jnr) of Harrisburg, PA USA. harrisburg full-service firm including bankruptcy, real estate, personal injury, commercial and business zoning, and family law matters. Organized in Philadelphia and Harrisburg in 1862, this little-known regiment served through many famous battles including Gettysburg, Fredricksburg, Chancellorsville and the Wilderness. harrisburg firm, offering services for real estate, estate planning, and workers compensation. harrisburg law firm serving clients in litigation, business, banking, securities, healthcare, employment, immigration, tax, technology, environmental and municipal law. 136 Harrisburg Diocese Cursillo Pennsylvania. Pennsylvania. Includes weekend dates, weekend applications for candiates and team, newsletter archive, palanca, and prayer requests. harrisburg firm, offering services for all areas of commercial practice & civil litigation. representing clients throughout the state and country, with additional offices in columbus, oh, hazleton, pa and washington, dc. harrisburg law firm, offering services for matters including litigation, personal injury, real estate, malpractice, business, family law, and estate planning. services for complex litigation, corporate transactions, real estate, bankruptcy, tax, and estate planning, from offices in philadelphia, harrisburg, and cherry hill. representing major public utilities in administrative proceedings, and offering services for matters including real estate, commercial transactions, and civil litigation, from offices in wyomissing and harrisburg. representing major public utilities in administrative proceedings, and offering services for matters including real estate, commercial transactions, and civil litigation, from offices in reading and harrisburg. court reporting and captioning services in harrisburg, and other centres. list of services and contacts. Regiment Roster of the 34th Infantry Regiment (5th Reserves), Company I, organized at Camp Curtin, Harrisburg, PA on 06/21/1861. Established in 1941. Site presents the organizations history, mission and creed, along with the present structure of the board of directors, and membership benefits. Also includes the activity calendars, details about past and future competitions, and the contact addresses. Visitors can also obtain information about the communitys web discussion group, the monthly newsletter 'The Compass', as well as facts about local attractions and cultural organizations in the area, and a arcade games section for online entertainment. Annual event in Harrisburg, PA, USA, includes registration form and contact information. sweet adelines chorus from harrisburg,Ãƒâ€šÃ‚Â pennsylvania. Rock band from Harrisburg, Pa. Includes show dates, news and links. Providing events weekly. Schedule, directions and booking information included. Rock and roll band from Harrisburg, North Carolina. Site includes a biography, photographs, and contact information. (1948- ), harrisburg, pennsylvania. sound files, videos and photographs of performances, biography, reviews, and awards and commissions. providing a program of cultural excellence for the mid-state region, serving both artists and the community through a wide variety of galleries, exhibitions and classes. Listing of events, classes, pictures and links of the Pennsylvanian affiliate of the RSCDS. Mailing list is also offered. harrisburg, illinois chapter of the barbershop harmony society. american-celtic band based in harrisburg, pa. profiles, tour schedule, photos and contact details. annual show held in harrisburg, pennsylvania. includes dates, times, and activities. the indoor and outdoor guards of susquehanna township hs in harrisburg, pennsylvania. SiteBook Harrisburg City Portrait of Harrisburg in Nebraska. 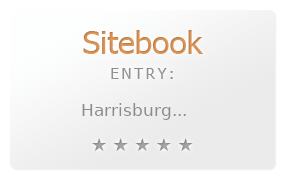 This Topic site Harrisburg got a rating of 3 SiteBook.org Points according to the views of this profile site.